It has been nine years since our company was established. We are appreciated all your support and encouragement during this time. To express our gratitude, we are offering a low cost Chinese and Japanese language learning service using LINE application. 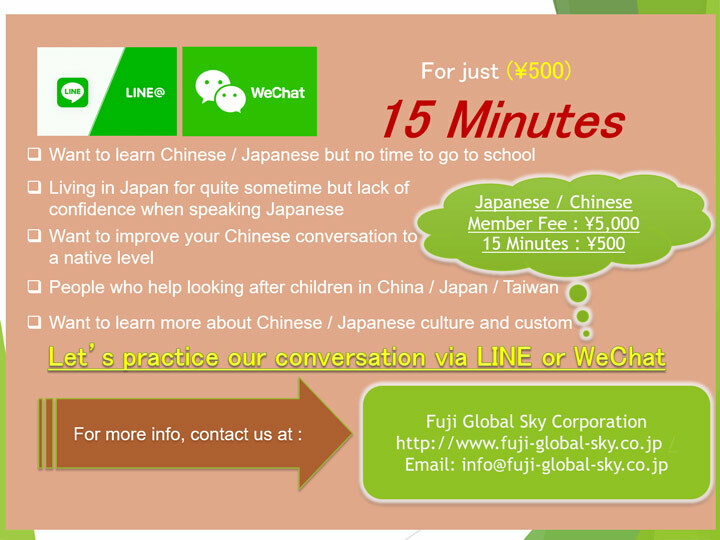 For those who are interested to improve their Japanese and Chinese conversation skill, you may enjoy this service at any time at your convenient. Our service is flexible time and economical cost, which meets the lifestyle of the current people and society. For those who are interested in improving their Chinese / Japanese conversation skill, you should give it a try. Do not hesitate further, come join us and experience our new service! Copyright© Fuji Global Sky.inc All Rights Reserved.